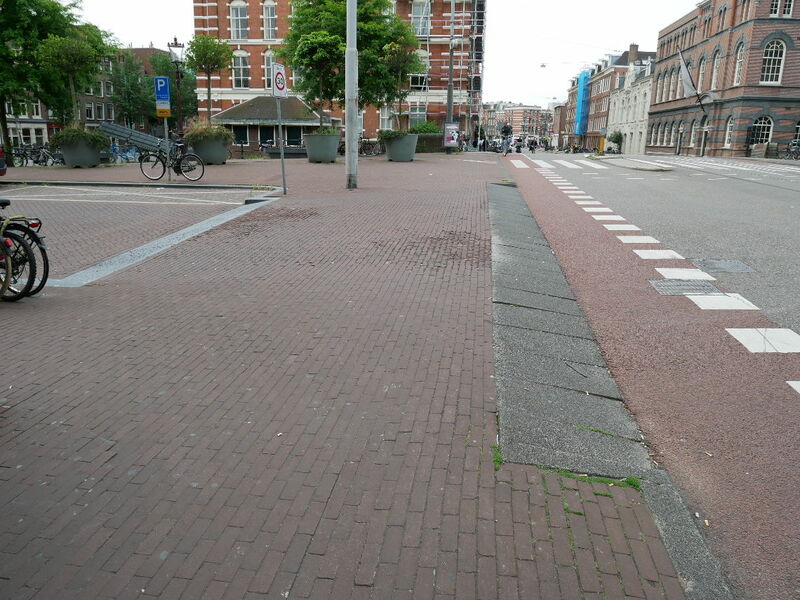 In Dutch cities and towns one of the features which first stands out to a UK audience (and those from most other countries) is the use of ‘continuous footway’. I’ve written about the significance of this feature before. 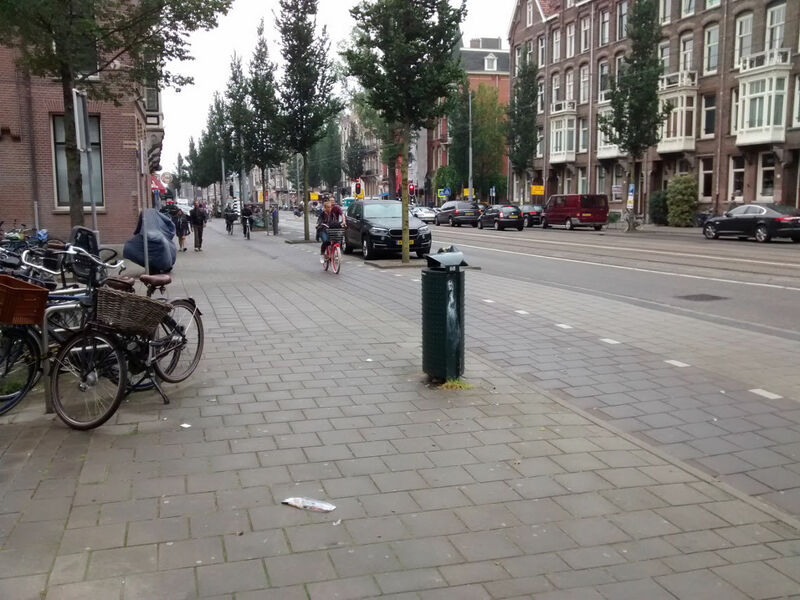 For previous writing on continuous footway see here (in ‘What Nobody Told Me’) and here (in Amsterdam vs Copenhagen part 2). What I’m talking about is the situation where a roadside footway (what we call ‘the pavement’ in the UK) carries on alongside a bigger road, crossing the end of a smaller side road without an interruption. You can see this drawn in the image below – indicated with a red arrow. There are different names used for this design – but in the UK it’s quite common to call it ‘continuous footway’. Often – as in the drawing – there is also a cycleway, but that’s not always the case so ‘continuous footway’ seems the simplest description. I’ve also heard the phrase ‘blended crossing’ – the reasons I dislike this term so much will become clear later. And I’ve heard ‘Copenhagen style crossing’ – although strangely this phrase was being used for something I never found in Copenhagen. 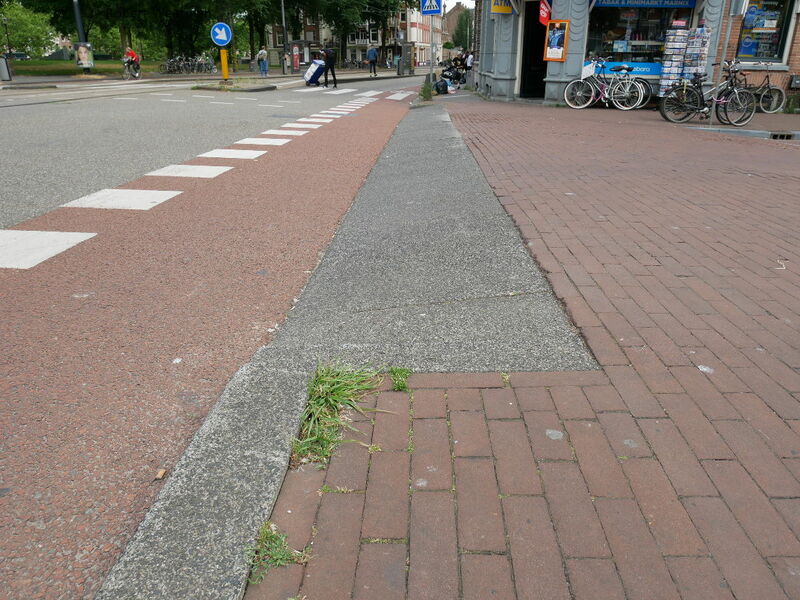 I should say that many Dutch people will look at you strangely if you try to talk to them about ‘continuous footway’. 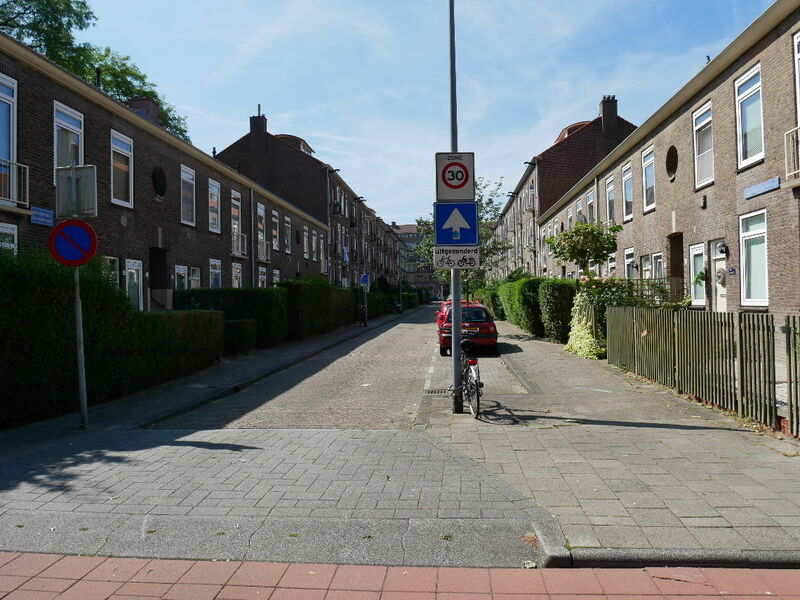 What we can see in the images I show here just represents ordinary Dutch street design. Continuing a footway across a road end is so normal that they don’t see a design feature here at all – they can’t understand how different this is to how most of the rest of the world works. 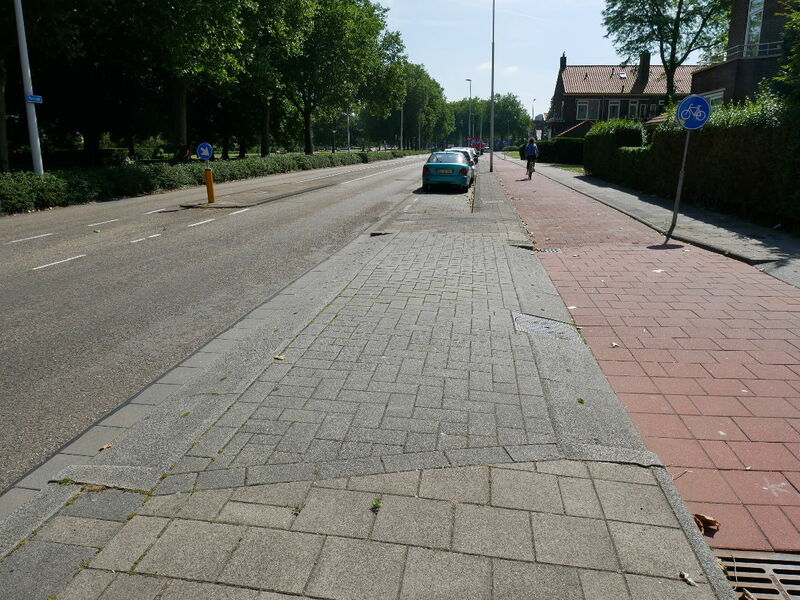 It is very important to understand that continuous footway is used in very specific circumstances in the Netherlands. This is used as much as a ‘gateway’ – indicating to people driving that they are entering (or leaving) the access streets belonging to a residential area. At this point you need to drive up and over a section of footway (and possibly cycle track). The speed limit changes at this point. The road materials will change. The road width will change. Most importantly, the streets beyond this will be designed so that they aren’t any use to you unless you are visiting a property in the area. You can see the sign in the image indicating that this is the boundary of a 30kph zone. This is just what people expect to encounter when entering or leaving such a zone, in a car or other motor vehicle. I’ve written much more about the residential local access streets which like beyond such a gateway in the article ‘I want my street to look like this‘ (which includes animations showing continuous footway in context). Here are another three images of the location above – from different angles (click/tap to see full images). 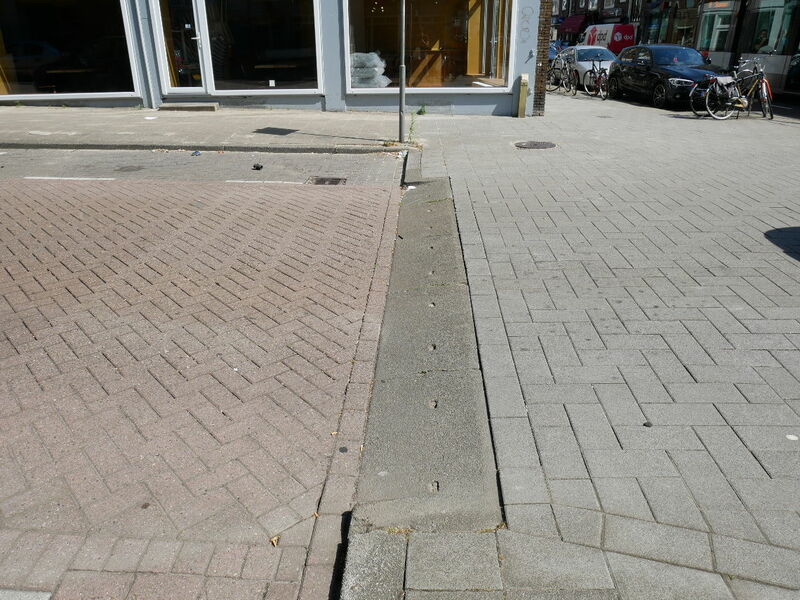 How can people think that the Netherlands is unfriendly for walking when you see that contrast? I know which street I’d prefer to be walking on. 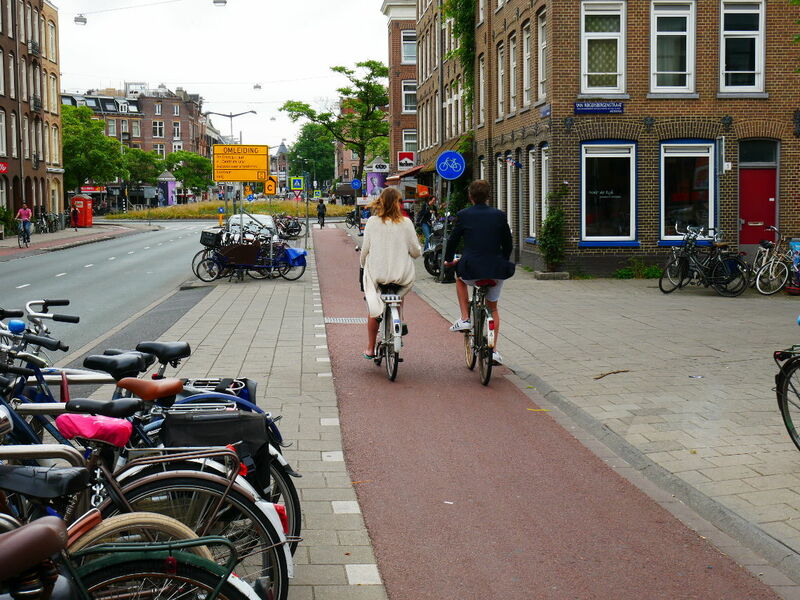 Dutch streets and roads are designed with a set of important principles in mind – based on their ‘sustainable safety’ approach. 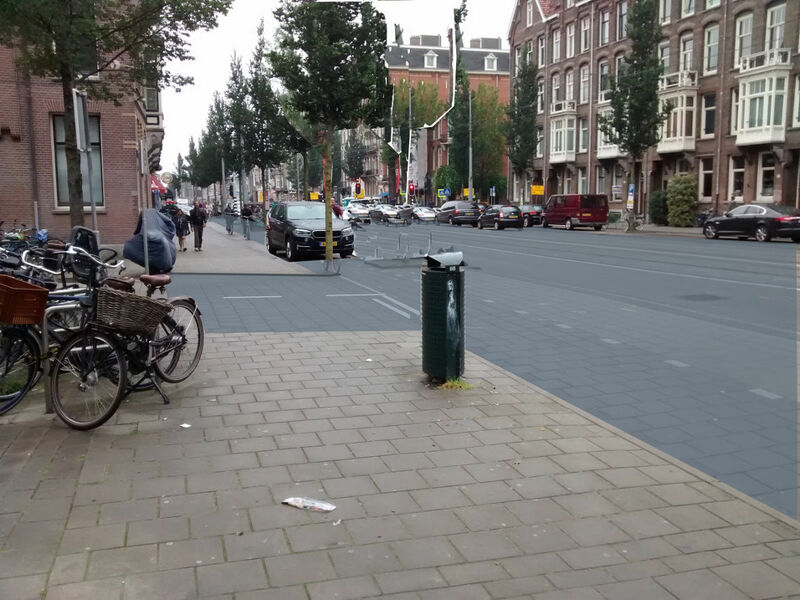 I think it is essential that we understand how important this approach is in defining the way that Dutch streets work. For an introduction read Mark Wagenbuur’s article here (but you can finish reading my article first). One of the important results of this sustainable safety approach is that Dutch design is simple and clear – in my words I think of ‘simplicity and clarity’ as, in effect, one of the most important Dutch design principles. 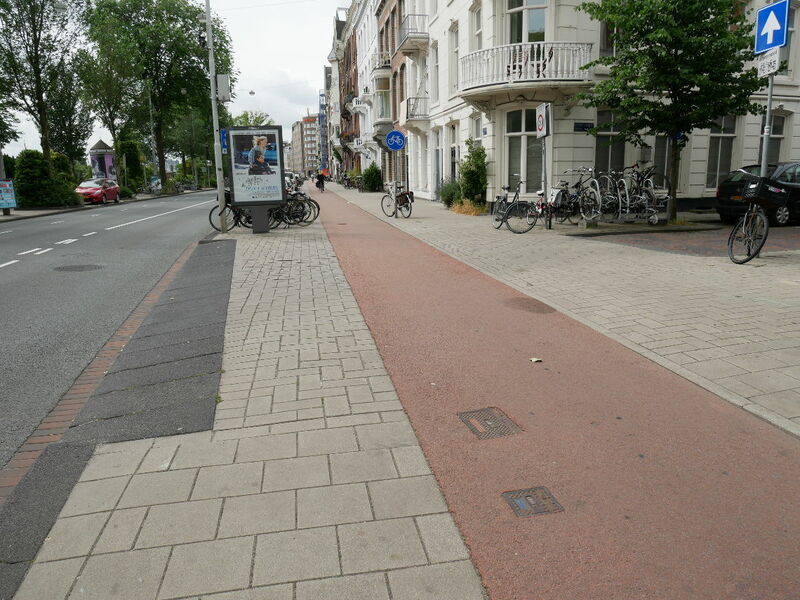 I believe that the phrase “Zelfverklarend wegbeeld” – meaning “self-explaining road” – is used to explain that the design characteristics of a street or road should make it completely obvious what behaviour is appropriate, safe, and reasonable. Look at how simple the street layout is here – but also at how clear its functionality is. There is no confusion – no mess – no vagueness. No special symbols or signs are required. It is not necessary to add lines on the ground. Nothing special tells people to give way. The basic design features make it completely clear that this is a space where pedestrians and people cycling have priority. It is relatively clear that you can drive over the footway and cycleway – but it is completely clear that this is what you are doing. You’re driving over the footway. This is not a place where the roadway and footway are mixed together or ‘blended’. This is a piece of footway/cycleway which you can drive over to get from one piece of road to another. What makes the design so simple and clear? The surface material used on the footway continues unbroken across the space AND onward (well beyond this local feature). There are no significant changes in colour, design, or material. There are no materials or structures indicating the edge of the space to be used by vehicles, nor suggesting that there is anything special about this piece of footway. This is not an accident. The Dutch designers didn’t forget to do something here. It is an essential and inherent part of the design – making it safer. The footway does not change height compared to the road. It is necessary to drive up and over the footway – making the presence of the footway really obvious. The edge of the main carriageway continues in a straight line without any indentations at all. 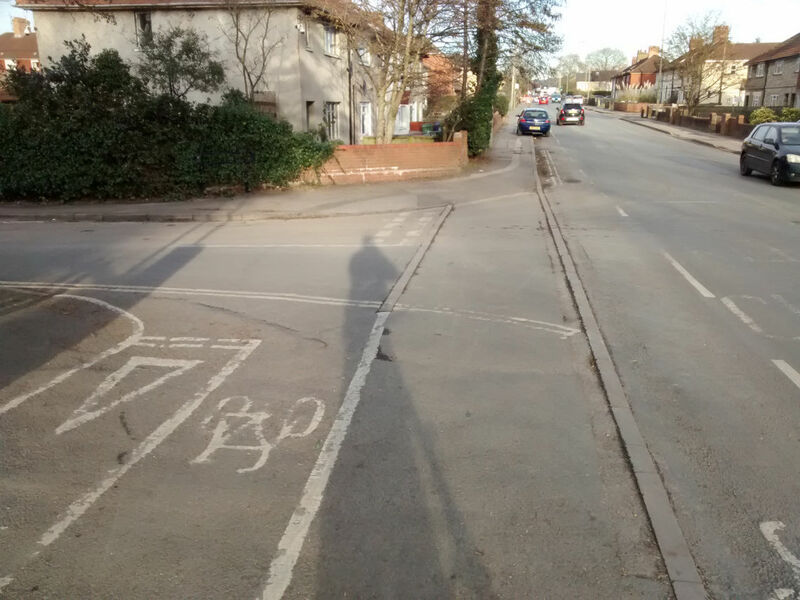 There is no kerb or kerb-like infrastructure highlighting the line to be taken by vehicles. There is no short section of side road allowing people to leave the main flow of traffic. This isn’t a flaw in the design. We won’t make a better job of this by changing this feature of the design. It’s a planned part of what makes the design work well. The cycleway also continues unbroken, with no changes in surface or material or colour or height, and with no special symbols. The end of the side road – where it meets the footway – is also really obvious. The road end narrows visibly so that it is only the width of one car where it meets the footway (and no parked vehicles obstruct vision). Aside from the visual simplicity and clarity here, a further design feature (necessary to keep the footway level) is a sharp ramp from the road surface, to the height of the footway. 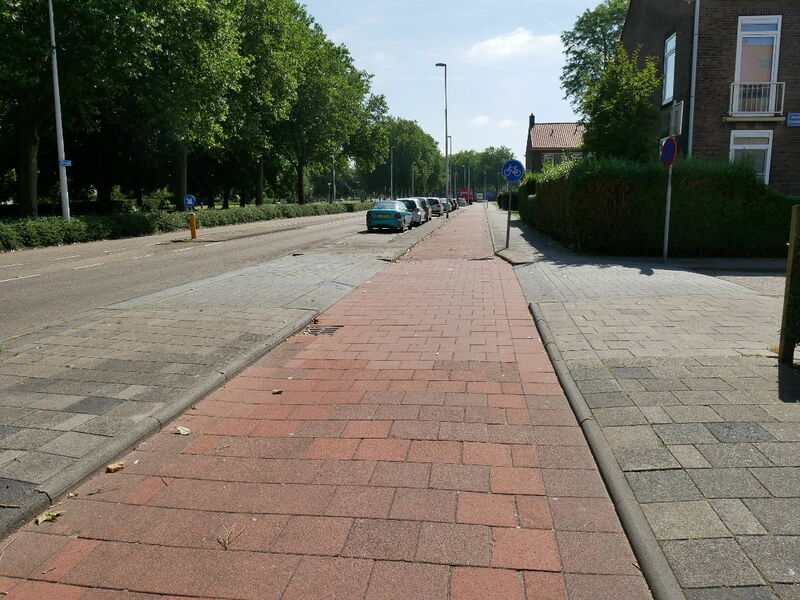 The footway is flat – the surface height change for vehicles happens over a very short distance – using special Dutch kerbs “inritbanden”. I’d translate ‘inritbanden’ as ‘entrance kerbs’ – search the internet for inritbanden and you’ll get plenty of images – and this commercial sales page has nice drawings. 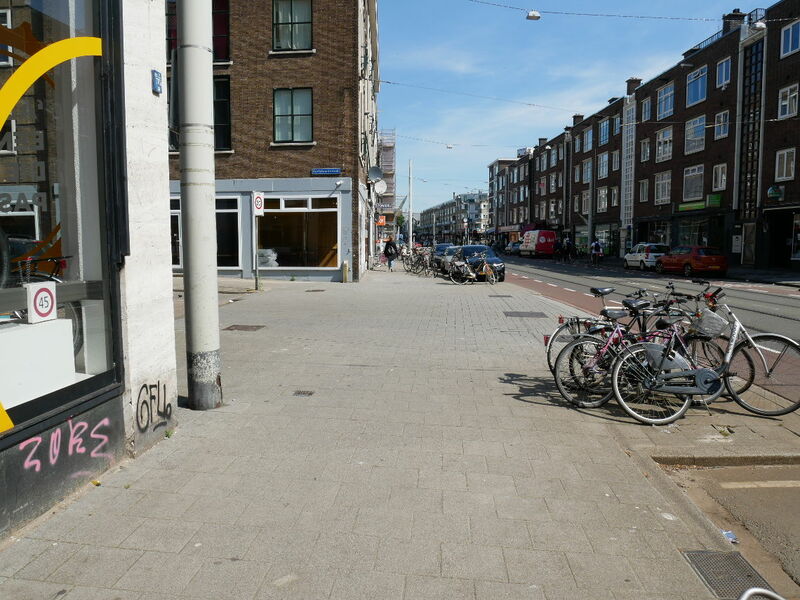 While we’re doing Dutch words – search for “uitritconstructie” – which I’d translate as ‘exit construction’ – for images of this whole arrangement… again emphasising that to Dutch people what we’re looking at here is seen primarily as a gateway/entrance/exit design. The inritbanden can be seen in the other photos – but the image below is helpful. The ramp on these entrance/exit kerbs is sharp enough to mean that if you drove an ordinary car over them too quickly you’d risk causing damage to the vehicle. Designs like this are not just ‘self-explaining’ – they force people to behave appropriately too. sharp ramps onto and off the footway meaning that those driving over the footway must drive very slowly. 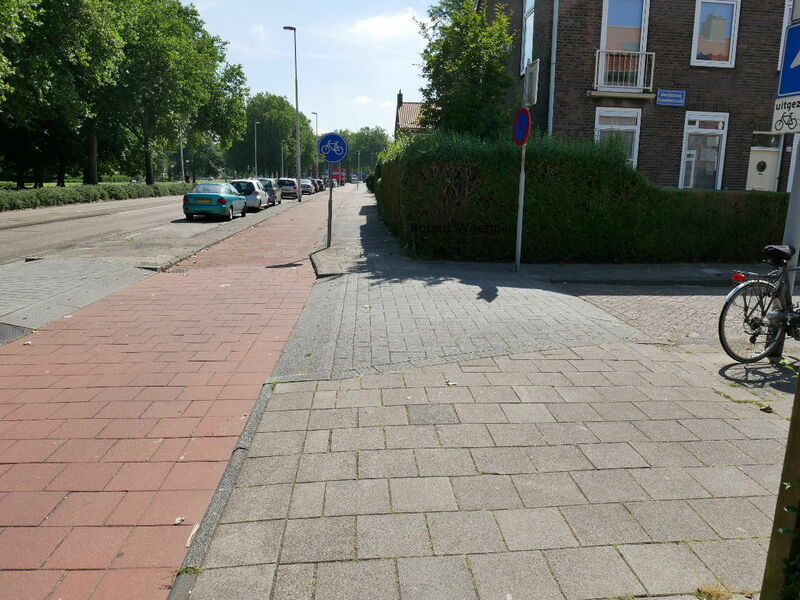 Not all continuous footway in the Netherlands is quite as good as this example – but examples this good are very easy to find. Here are images of five more locations. Some of these locations include a continuous cycleway (off the road) but some don’t. All show the features I’ve listed above. Moving on from the pretty pictures – I think that it is worth looking even more deeply at how these designs work. Specifically I think that it is worth thinking about how we (as road users) “read” the infrastructure here. We should look at what signals or messages these designs send us – or if you like, how these designs “talk” to us. The reason that it’s so important to consider this – in such depth – will become clear later, when I show the results of bad design. We need to remember that users of roads and streets are imperfect. They are receiving lots of signals – lots of messages – from the world around them. And they are usually thinking many thoughts simultaneously. We might have special symbols or signs to communicate messages to people, but these are human beings not computers. Human beings filter the environment for the messages they most need – and designs like this communicate these important messages really clearly (above the noise if you like). Think about last time you drove along a road you didn’t know. Did you really read every road sign? Did you read every street name? Were you carefully analysing and considering all options and decisions? Or – more likely – were you partially on ‘auto-pilot’? You might have been thinking carefully about what road to take and whether you were late for an appointment – while some deeper part of your brain took care of steering the car to keep it on the road. The point is that people filter the signals and messages they receive, usually based on their expectations, ignoring much of what they see. If our design is different from the norm then we need to make sure that the most important messages win out over the less important messages – lifting the important stuff above the background noise. It might seem odd to discuss about how these designs talk to us – but that’s because in the Dutch designs shown here the messages are so clear and simple. Let’s look at what can go wrong. Let’s look to the UK. In moving on to criticising designs in the UK I want to make it clear that I appreciate the bravery and determination which will have been needed to get these ‘new’ designs in place – to break from the UK norms and to try to improve things. The pressure to ‘do things normally’ in the UK (and almost everywhere else) is enormous. Anyone prepared to stick their neck out and ‘do things better’ deserves our/my admiration. At the same time this blog isn’t going to be much use – in achieving what I set out to do in writing it – if I only talk about what works and not what doesn’t. I’m not aiming to criticise people directly involved in the designs I show here – I’m actually doing my best to show where compromise leads to bad results, and I’m pleading that the same people are in future given the support and tools they need to do the job properly. Here are two examples from Glasgow. These are actually pretty good and work well – despite some failings when compared to the lists above. I’ve included them to show that some compromise can be allowable in some circumstances. These are on sections of street which have high pedestrian usage, and cross the end of very narrow lanes. Visually they still look a little like roadway from some angles – but the buildings and the crowd – the sharp ramp, and a fairly clear and straight carriageway edge – make them pretty effective. Interestingly I’ve walked over these for years without noticing them. Someone did a good job here – but I’m still going to argue for ‘better’ next time. You might think of it like this (referring to the image below). The nice straight kerb edge, and the continuation of the double yellow lines, both tell us that the carriageway is the black stuff. There is also a message from the change of materials on the footway – suggesting that this might be regarded as a piece of roadway – but this message is very much weaker. I’ve indicated the relative strength of these messages with the colour and size of what’s drawn/written on the image. The image below shows what this design looked like when I first visited. I thought that it was not perfect – but I observed that it seemed to be working and I was enthusiastic. Here is a very short video of the effects – showing that the person driving here understood what was expected of them. To those in some countries (where it is customary to wait for those on foot) this will look unremarkable – but to those of us in the UK this behaviour is remarkable. Now, based on my list of essential features it’s clear that this design isn’t perfect. In particular, the kerbs and cobbles suggest a road end. We receive what might be called ‘blended’ messages from the infrastructure – about how to use it, about who has priority, and about what the purposes are of each surface. After the lines/paint was added – the view for someone driving into the side road. With one tiny bit of paint we’ve VERY significantly strengthened the messages – for those driving, looking from the road where I took the photo – that this is a roadway. Yet many of the most important design elements, viewed from the perspective of those on foot, continue to suggest that it is footway. After the paint – for those on the footway/cycleway. This is what I mean by the blending of designs or messages. 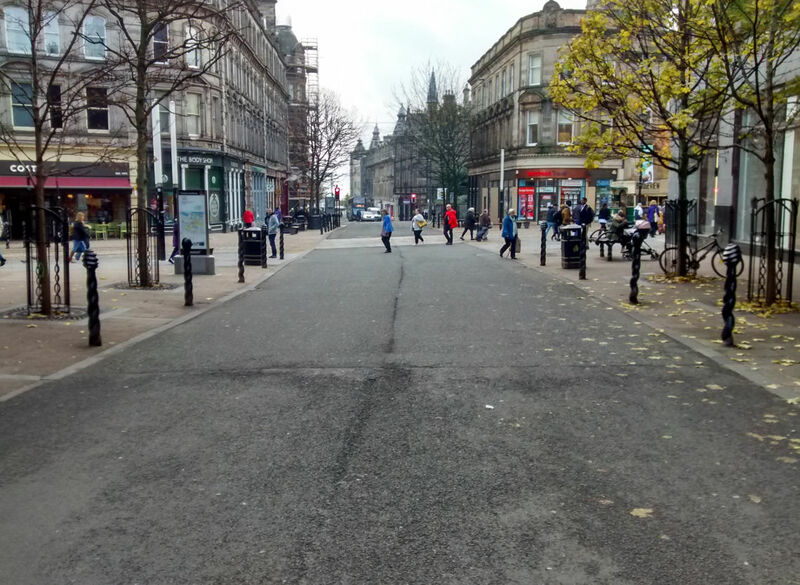 There are now mixed messages being given – both to those on foot and to those driving – messages making it unclear whether this is road or footway. Which is VERY different to the Dutch design – where it’s obvious TO ALL USERS that the footway is footway – that the cycleway is cycleway. This is a problem. People driving – accustomed to seeing roadway – driving in a manner based on their expectations of normal UK behaviour – are likely to see the roadway first and other features only as secondary (if they notice these at all). But those walking or cycling are relatively likely to see footway/cycleway first, and notice the roadway second. Faced with a complicated and confusing situation – people driving, LOOKING FOR ROADWAY, will see first a roadway. They’ll mostly take notice of the stuff I’ve highlighted with red lines – taking only secondary notice of the stuff I’ve highlighted in blue. The visual signals sent to someone driving into this side road. Of course we CAN see that something is different here. Most people, standing where I took the photo, with time to spare, will see that something is different. But these messages that something is different have to fight for attention above the noise and above our expectations about how roads work here in the UK. And these messages need to be processed in a second or two – as someone approaches this junction at 30mph. Somewhere – somehow – a strange idea seems to have emerged in the UK. The idea is that blending normal designs together will give us something safer. The idea is that people, driving, cycling, and on foot, when faced with a confusing design, will slow down, take care, look out for others. 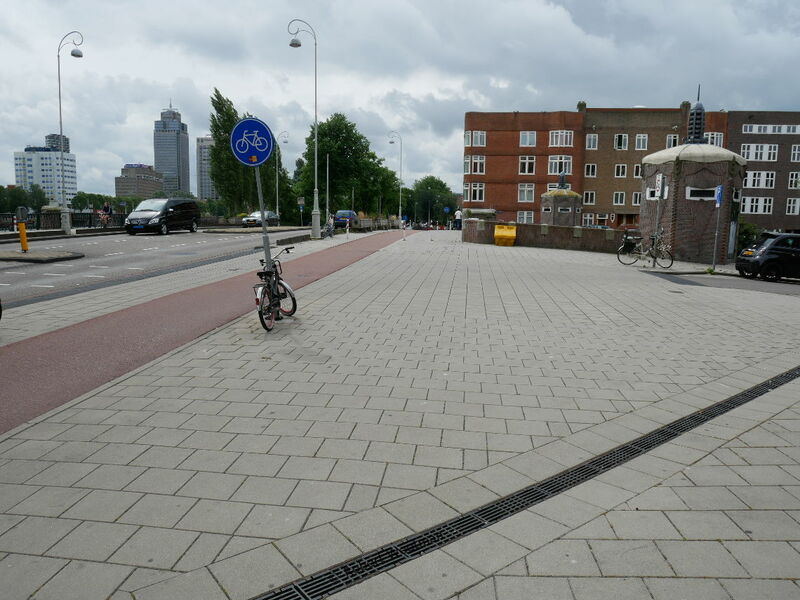 The simple and clear Dutch continuous footway is seen as a more dangerous design – and mixed up and compromised designs are seen as safer. Now to be absolutely clear – it certainly seems to me that it is possible, through design, to change how quickly people drive, or how much attention they pay to others. Making someone who is driving less certain about the priority they have over those on foot might make them slow down a little. That can be a good thing. There are even situations where AFTER vehicles have been made to travel more slowly it can then also be helpful to increase the confidence of those on foot that people driving will wait for them. But designing consciously in this way isn’t the same thing as just blending designs together so everyone is faced with more complexity. In many places the blending of the messages that we receive from infrastructure simply makes things more dangerous. If you can design so that you clearly signal to road users that something works differently at a particular location, you might cause them to take extra care. But if instead you design something that people find confusing, they will filter out the confusing signals and ignore them, and will look for what’s normal, and will behave as normally as possible using only what they can see as normal as a guide. One of these results makes people safer. One of them puts people at additional risk. The difference between a design which creates the first result and one which creates the second result is very very fine. If we’re going to introduce infrastructure like Dutch designers use to make their towns and cities more people-friendly (and I hope we are) we almost certainly need to do it properly. The Dutch designs aren’t the way they are – safe, usable, and understandable – because people there are somehow trained to behave properly and to understand them. The Dutch designs are the way they are because this has proven to be the best way to design them – this has proven to be the best way to create the desired effects in all users. The Dutch designs are designed the way that they are because this is the safe way to design them. How can we have found ourselves half-copying a design and assuming somehow that half-doing something properly makes it a safer design? This is not true. It does not work. 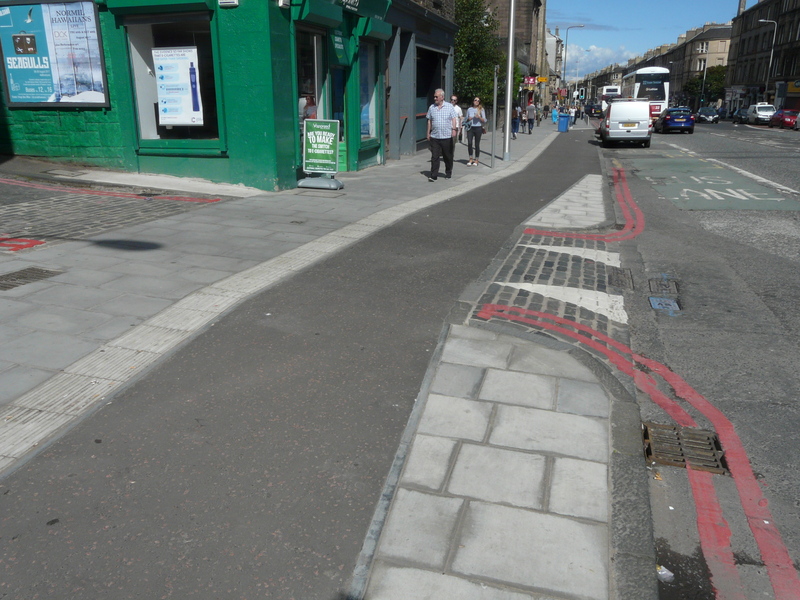 As an aside from the consideration of continuous footway, another very different Scottish example provides a really clear illustration of why ‘blending’ designs is (usually) a bad idea. This was pointed out to me as being a site where there had been issues between people driving and people walking. When you look at the design that’s not at all surprising. This is what people see when they are walking up the pedestrianised street. What’s not obvious is that a road – carrying large and sometimes fast vehicles – crosses the street here. Observe the behaviour of the truck driver in the video. He/she doesn’t slow down significantly – meaning that at least one of those crossing is put at some risk (had someone stumbled or fallen the truck would not have had time to stop). Streetview: from the road and from the pedestrian street. So to people who are driving this appears to be almost a normal road (although to be fair there are some restrictions on what vehicles can use it). But from the pedestrian street it appears as a continuation of the pedestrian street. How is that a good idea? I like the idea of removing the certainty, for those driving, that they have priority… but that’s not what happens here. If a design is to have an effect on safety and priority then the visual effect of the design FOR THOSE DRIVING has to make it clear that people on foot will be taking priority. It might be half-hearted in indicating to people on foot (or cycling) that something is different – but it can’t be half-hearted in indicating to those driving that something is very different. Remember, this is the UK. It is not unknown for people to use vehicles to drive AT a pedestrian who is in the way – seeking to frighten that person so they learn not to do this again. Mild visual uncertainty will simply be ignored – and people (driving) are very likely to assume that the road continues in the normal way – and that they should behave as normal – not even slowing down. There are relatively simple ways to fix this particular design I think. Probably the road needs to narrow considerably. It’s a two way road (surprisingly). Forcing this into one lane would mean people having to slow to wait for one another if there was oncoming traffic. This would increase safety in itself. The defined crossing area needs to have a much stronger visual presence – and it needs to be VERY MUCH wider. A sharp ramp would physically prevent people from driving fast. And something is needed to break up the view of a roadway (wide, with straight kerbs) going into the distance if a driver looks further ahead. 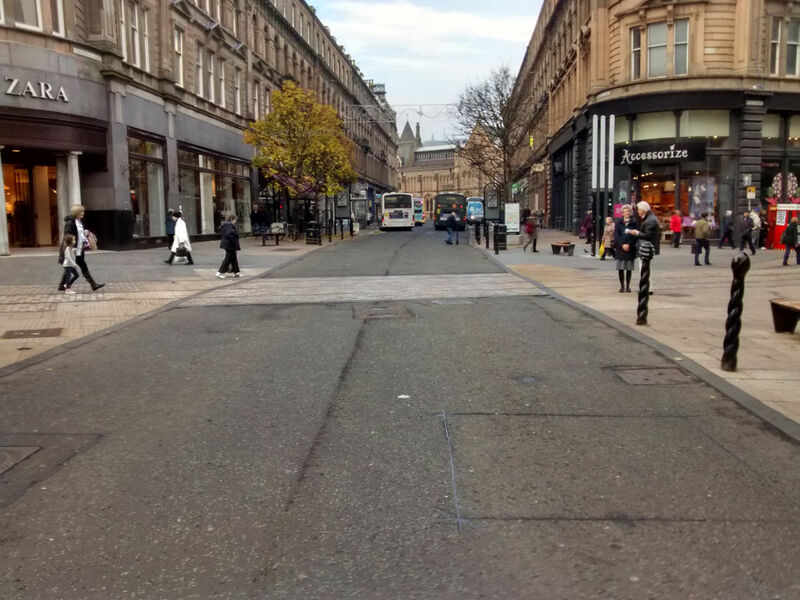 Better still – if we want a pedestrianised street (and well done those who made this happen by the way) maybe we should design a pedestrianised street which you can’t drive across at all. 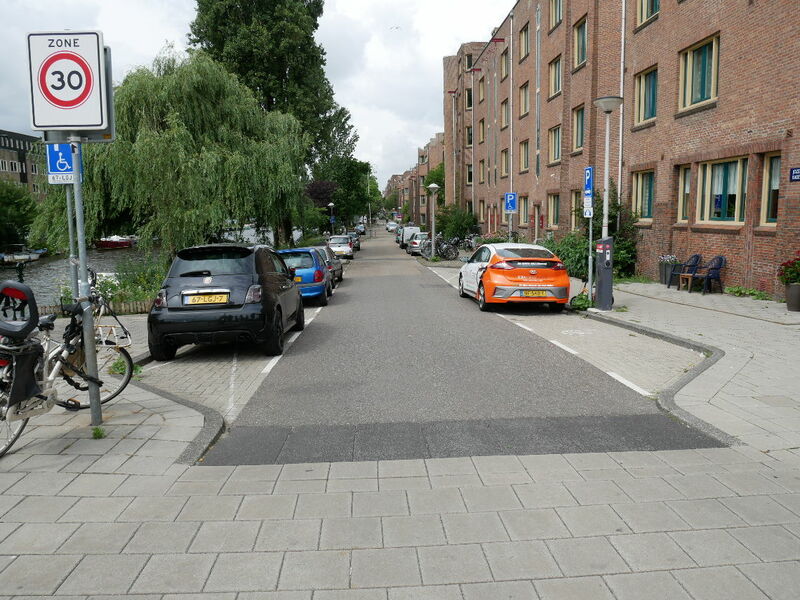 Sometimes, rather than attempting to create continuous footway, Dutch engineers use an alternative approach. Here are a two examples. I include these not because I like the design very much, but because the design remains clear. The standard red tarmac screams out the message ‘cycle track’, and the standard ‘elephant footprint’ white markings also scream out ‘cycle track’. Both designs are compromised – but both remain relatively clear. When people outside the Netherlands compromise in similar situations then the results can be really pretty poor. I don’t think this one works at all – not even slightly… it makes the ‘blending’ mistake again. How much attention do you think those driving vehicles in this confusing environment have for noticing the green stripe? Compare this design against my checklist above. Consider what I have written regarding messages/ clarity/ simplicity. The issues here become obvious. 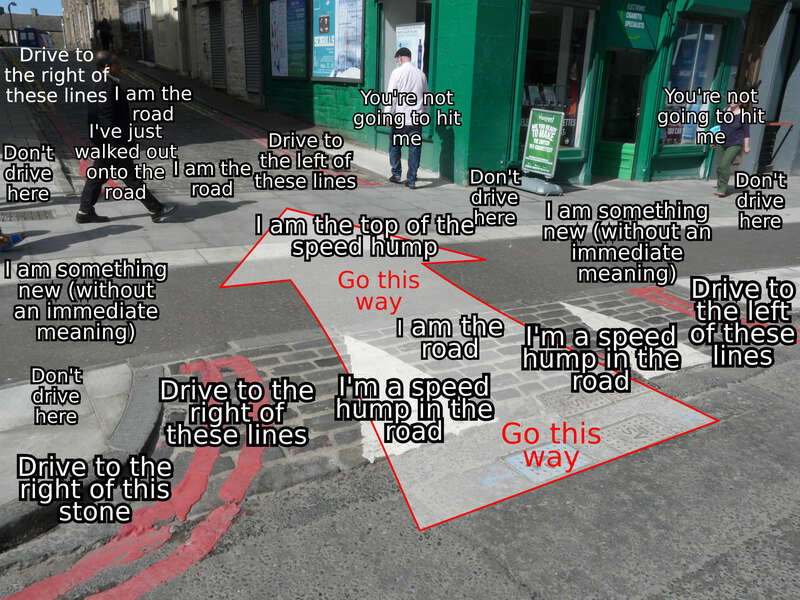 In these examples, from the perspective of someone driving, the message that there is a crossing here – which it is utterly essential to communicate – is lost in the confusion. One hope I have is that at some point somebody will begin to work on a standard UK road marking suitable for indicating the presence of a cycleway crossing a street like this. Elephant footprint markings might be ideal as part of the solution – where a continuous footway solution isn’t suitable – IF they had some matching rules to support their safe use. They are now allowed for indicating crossings at signals. And surely it is time for the UK to agree on a colour to be used to indicate infrastructure for cycling. 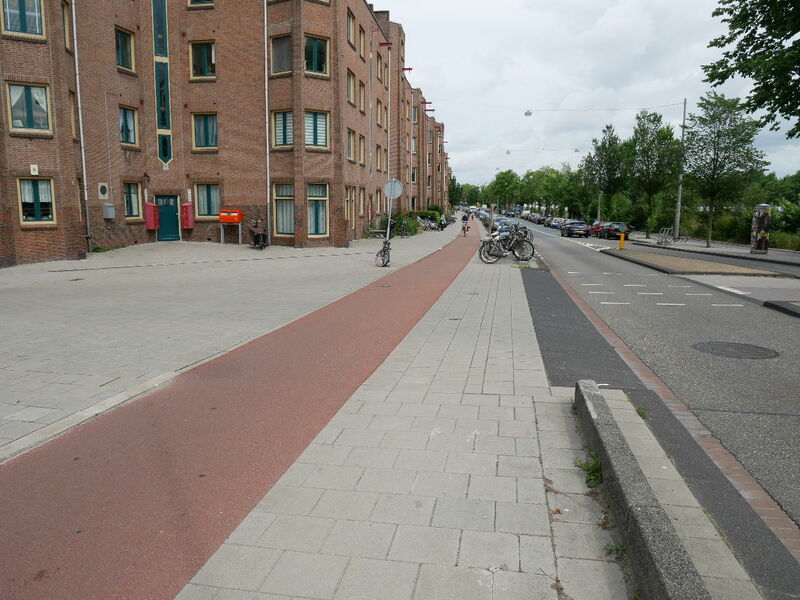 By far the most powerful indicator of a cycleway in the Netherlands is the standard red/brown colour (not used for anything else). Here in the UK – we’re so busy protecting our standardised systems and symbols from any change at all that infrastructure to support cycling (which doesn’t fit this limited system) is being delivered completely differently in different locations – varying even from street to street within one city. In the Netherlands, where they are good at experimenting and trying new ideas, and where I’m told ‘pragmatic rule breaking’ is a national habit, they’ve ended up – as a result – with well standardised systems. When we are trying to change how people behave on our roads, half-heartedness multiplied by half-heartedness often produces something actively dangerous, not something safer, and not even something half safe. A half-hearted attempt to signal pedestrian or bicycle priority can create something more dangerous than if you hadn’t bothered at all. A half-hearted narrow cycle lane on a road can make the road more dangerous to cycle on than a road with no cycle lane. With rare exceptions, blending the messages we receive from infrastructure – blending two safe designs together – doesn’t produce something safer, but something more dangerous. If we’re to find a way to support people to re-engineer our streets, roads, towns, and cities – making them pleasant and safe to walk and cycle around – then we need to actually allow them to implement the designs which have been proven to work elsewhere. Dutch people are just people. Danish people are just people. Their designs work because they are good designs, not because the people are any different. 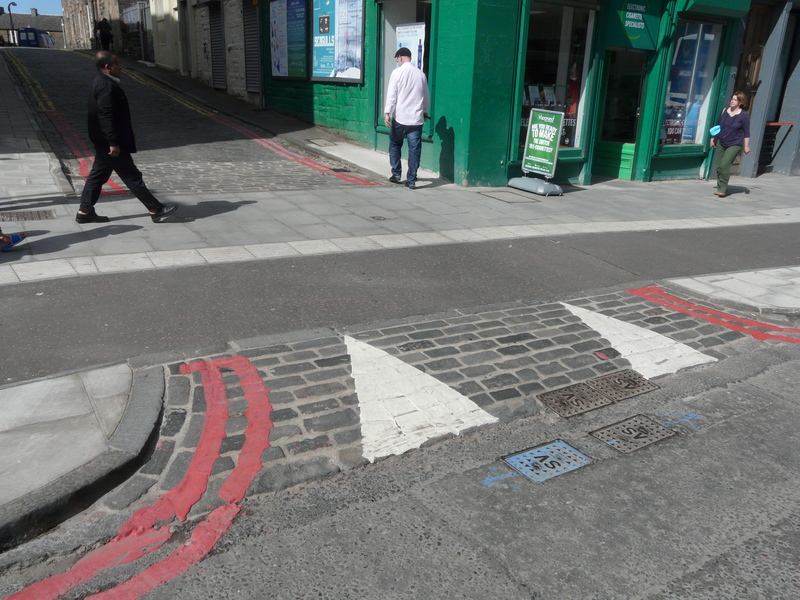 There are differences in law and habit which we have to work with in the UK – and there are differences in the road markings and signs which people are allowed to use – so we can’t just copy everything and expect it to work. But we CAN change the law and we CAN change the road markings we have available. These are just my opinions. If you have an alternative view, or you’re Dutch and want to correct my interpretation of the infrastructure and policy in your country, or if you have good examples of continuous footway in the UK which I missed from the list, then do please comment below. Streetview list – continuous footway, UK. The following links to Google Streetview images provide other examples of continuous footway in the UK (this excludes lots of examples where there is little attempt to actually continue the proper footway – these are at least attempts to do the real thing). Some of these examples show really good design. Some of these examples show really bad design. I’ll leave you to work out which are which. The new shiny ones aren’t always the most effective – look for the design features I’ve described before you are fooled by new materials. Kennington Park Road, London: 1 (see also video). Continuous paths across minor junctions from the same source. Super helpful overview and analysis – thank you! You do this better than anyone else, Robert. Thank you. Thanks for that. Glad you found it useful. Interesting article Robert. I assume that what causes UK engineers to reject ‘Dutch’ continuous crossing is a feeling that they’re ‘unsafe’, as people (particularly the partially sighted) aren’t aware that a vehicle might occupy the same space as them. Your article contains very compelling reasons as to why this thinking is mistaken. However, I think in order to fully convince UK engineers and politicians to adopt continuous footways as standard practice, a quantitative comparative analysis of safety between the two designs, factoring in perception of safety for the partially sighted, would be helpful. Quite a big task – perhaps there’s a masters project in this! I strongly suspect that such an analysis would agree with your conclusions – that Dutch continuous footways are not only more pleasant to use, but are empirically safer than UK design. With academic safety research as backing, it would then be difficult for anyone to refute their implementation in the UK. Nice idea. Something to think about – and you may well be right – but I’m not entirely convinced. Does UK design work by logic and evidence? Or does UK design work by habit? I suspect the latter. On the whole I think that what I see is a set of professionals who – for good reason – are reluctant on the whole to break from the pack. If someone designs something different and a person gets hurt then the finger of blame can be pointed at an individual (or team, project, initiative, etc). If someone designs something ‘normal’ and someone gets hurt then the finger of blame is pointed at the person who gets hurt (or perhaps the person who hurts them). Maybe it’s a bit like the battle to stop people smoking – evidence can certainly play a part, but evidence isn’t enough, and evidence isn’t even perhaps absolutely necessary. Nice piece. I don’t know the relevant rules in the UK, but in the Netherlands cars leaving these exit constructions have to yield. Which means additional signalling to indicate priority isn’t necessary. Thanks. If I understand correctly the Dutch ‘rules’ really just emerged from people starting to create these designs – it wasn’t rules first design second, but design first rules second. (See this tweet) And then it’s not really ‘rules’ which make things work but conventions, habits and shared understanding. In the UK we’re at the beginning of that process – there are different ways to interpret the existing rules, but plenty of people think that the existing rules can be bent to apply to what are new designs for us. I think that this is actually another reason to do things properly – there are already sensible rules which apply to driving on footway. There aren’t any rules which apply to driving on/walking on/cycling on the sort-of-footway-like-road-which-might-be-footway-or-not which we’ve started to create here. As a Dutchy, I found the white triangles in the British examples confusing. In Holland a road marking like that, called shark’s teeth, is used as a give way sign – the teeth point towards the one who has to give way, just as in the give way sign itself. If shark’s teeth are used in such a continuous footway construction, they are always placed before the footway, with their flat edges along the footway or cycleway border (whichever comes first, from the viewpoint of the arriving car; it’s not acceptable to block either): crossing cars need to give way to pedestrians on the footway. 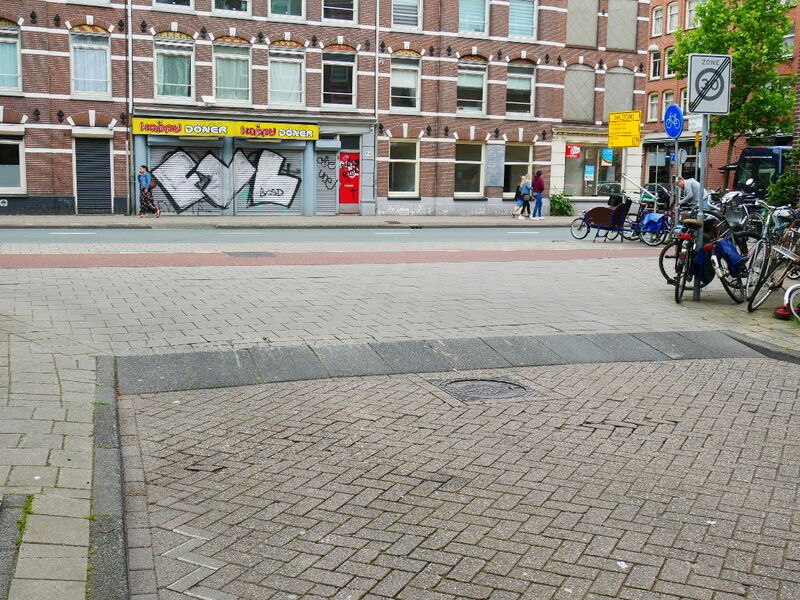 In the British examples, they were placed beyond the footway, signaling to Dutch eyes that cars exiting the side road should wait on the footway (blocking pedestrian traffic) until the main road is clear. It finally dawned on me that probably in Britain these triangles are a symbol to mark a ramp or speed bump, and always point upwards to the top of the ramp. We mark the top of the ramp with a white line instead, with little lines hanging down from there like a row of little icycles (or maybe half a zipper), but the standard exit & entry construction with inritbanden does not usually merit marking as a ramp. As you clearly showed in the pictures, but didn’t emphasize in the text, I wanted to mention this: ending the parking on the sidestreet a little before the crossing is important too. Letting the pavement bulb-out start early gives drivers coming from the side street clear sightlines to look for approaching pedestrians before they get to the crossing. Ending the last parking bay in a tapering off shape makes it easy to get in and out of, and creates a natural transition. The triangle markings for humps and bumps are a bit of a mess I think. In comparison to Dutch standardisation, UK infrastructure design seems very variable – which is ironic given how carefully the UK protects its standardisation. I think that what happens is that the ‘standard’ practices are so difficult and slow to change it means that somehow new habits and practices emerge without any sensible thought or planning. You’re absolutely right that this is what the triangles mean. What’s really odd now is that there are places where people have been experimenting with putting triangles like this on roads to make people think that there is a hump, when there isn’t one. Another great piece! Let me know if you ever want photos of anything in Oxford as examples. 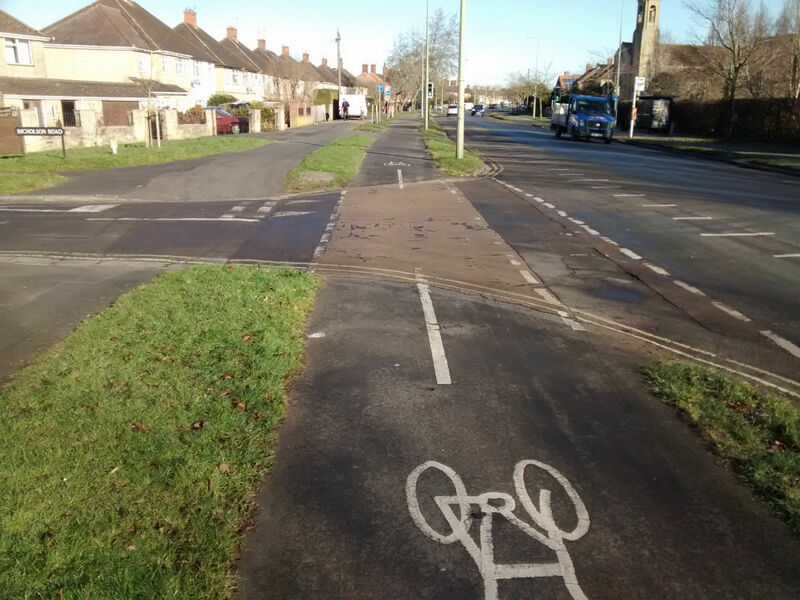 “cycling seemed to survive there [Oxford] despite how it was treated, not because of how it was treated” – those were exactly Andrew Gilligan’s conclusions in his ‘Running out of Road report. Things are slowly getting better, slowly. I find your insights very helpful. Thank you for sharing. I have a technical question, that I would appreciate any help with. I gather that the standard dutch curb is 8 cm. Q: What slope is acceptable for motor vehicles to mount continuous footways across minor street accesses? The Inritbanden come in an assortment of slopes and depths. I have an application where a couple hundred motor vehicles per day would use the access. Adam I’m sorry, but I can’t answer that question. I consider myself an expert in infrastructure usability/ergonomics, not the physical/engineering side of things. I’ll tweet the question for you if you like. I have Dutch followers on Twitter, and a load of international followers with more engineering expertise than I have. Where are you? Local availability of kerbs varies. Hi Robert, I am in Canada. I am realizing that our curb entry allowances are well below the slopes that the Dutch use. We generally limit entries to 8% for a private entrance, I think it comes down to what a snow plow can reasonably manage. I think that these Dutch entries are around 15%, albeit for a short distance. This has some dimensions in it. I imagine that the need to deal with snow introduces some very specific problems – however experience makes me think that problems like this can be overcome once people think it’s important to overcome them. Perhaps the key here would be that these features are cleared by whatever machine is clearing the cycleway… implying of course that there is such a thing being done… My point is that there will be a technical solution. I’ve enjoyed a lot of your articles, but especially this one since living in the Netherlands. I now can fully say with conviction that I refuse to cycle in London. It’s too militant and the infrastructure makes little sense even from a pedestrian viewpoint. And actually to the point that I started documenting it in an album aptly titled “things in London that make no sense”. I would happily share my take on egregious examples.